As a freelance journalist, Peter has interviewed over 25 bassists including Claypool, Manring, Doug Pinnick (King's X), Berlin, Pattitucci, Kaye, Wooten, Willis and many others. 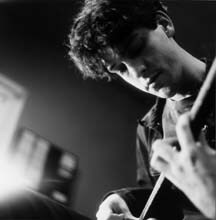 He interviewed Alain Caron for a Bass Player cover story in '96, and had a regular bass column in Canadian Musician magazine from 1992-'96. Peter's live and studio gigs have included appearances with Carmine Appice (Rod Stewart, Jeff Beck), Rob Affuso (Skid Row), Alain Caron, Paul DeLong, Tony Springer, The Dexters and many others. He jobs with all kinds of original and cover bands in the Toronto area. Peter endorses Eden, DR, Seymour Duncan Basslines and Visual Sound. Availibilty: I'm currently touring about 3-4 months out of the year. Contact for availability. Required attitudes (from students): Positive attitude, enthusiasm for playing and practicing. Must have a current practical outlet, i.e. a band of some kind.